The Mississippi River provides a backdrop to many American holiday traditions, but my favorite is Louisiana’s Christmas Eve bonfires on the levees. The story goes that the bonfires light the way for “Papa Noel”, the Cajun Santa Claus. Others say the practice helped local parishioners find their way to Christmas Eve services. 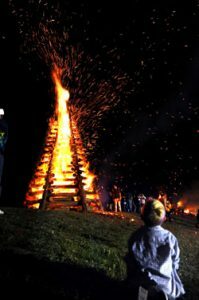 In either case, the inferno-based local tradition has become a Christmas Eve destination in and of itself, lighting the winter skies above St. James Parish 30 to 40 miles north of New Orleans. And, today the fires number 100 or more. It has become one of the few remaining local holiday traditions in this era of sameness. It helps to be off the beaten path and beside America’s enduring river. Originally, the bonfires were pyramid-shaped cones about 20 feet high. But as tourism has grown, so has the imagination of local fire builders, resulting in elaborate structures resembling cabins, trucks and indigenous figures. In some locations, residents fix up a batch of their favorite gumbo recipe and provide free bowls to visitors. Other locations have incorporated fireworks. Narrated tours of the bonfires are now available via four-hour and six-hour Gray Line Tours. But I think going early to communities like Gramercy, Lutcher or Paulina might be a better way to “feel” the tradition. Take the Great River Road ahead of time, and you might even find a good place to take in not only the festivities, but some of the preparations, cuisine and color as well. Who knows, you could find much more than a fiery holiday tradition along the way. This entry was posted in Culture and History and tagged Experience the Mississippi River, GrayLine Tour, Great River Road, Mississippi River, St. James Parish. Bookmark the permalink.